Search Results for "mobile phone while driving"
CHIANG RAI, THAILAND - SEPTEMBER 21 : CHIANG RAI, THAILAND - SEPTEMBER 21 : unidentified asian woman using mobile phone while driving on September 21, 2018 in Chiang rai, Thailand. 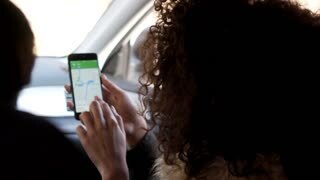 A man is playing a game on a mobile phone while driving a car. 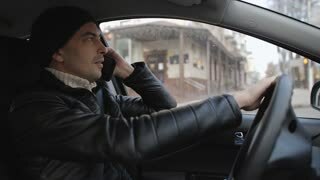 Confident millennial man talking on mobile phone while sitting on driver's seat in car. Handsome male driver chatting on cellphone in car during a bussness trip. 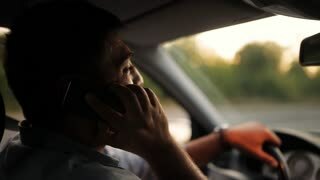 Driving and talking on mobile phone 4K. Female person in beige sweater steering car wheel and holding smartphone taking a call. Bright background through windows. Irresponsible man driving car and surfing on mobile phone while being stuck in traffic. People stock footage shot at summer season time. Close up. Serious schoolboy is talking on the mobile phone while sitting behind the steering wheel of a car. The child is driving. Children like adults concept. Side view of handsome male driver in casual clothes holding steering wheel and chatting on mobile phone while sitting in car. 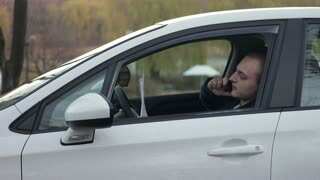 Businessman making a phone call while travelling by car . Successful pretty businesswoman in stylish outfit talking on smart phone while sitting on driver's seat in the car during road trip. Confident woman chatting on mobile phone during business trip. Portrait of young handsome man speaking on mobile phone in the car.